The Superchargers, currently compatible only with the Model S, provide 170 miles of range in a 30-minute charge, according to the company. The cheapest version of the Fremont, California-built car enabled to work with the Superchargers costs $73,070, according to Tesla’s website. While filling up might only take a few minutes and get you much more range, 30 minutes for 170 miles is pretty damn impressive, and is much better than most other electric vehicles which don’t offer any quick charge option. Love it or hate it, the battery-powered electric car is becoming an ever more feasible alternative to a petrol-powered vehicle. Apple have put together a great page on their website in celebration. It’s something I’d wager almost every iOS or Mac device owner has done at some point, I certainly have. Surprisingly, while there are many, many sources for app reviews, roundups and Apple news, there are very few that focus on educating readers about how best to use their Apple products or the apps they run. For the last few months, I’ve been working on a new site to do exactly that, called The Instructional. My aim for the site is to provide in-depth guides and workflows for Mac and iOS, picking up where most app reviews finish by exploring the various features and functions of apps for, and features of, both iOS and OS X. The site will have something for everyone, from new iPad owners to seasoned Mac users. Each post will explore a particular app or feature, providing easy and clear instructions and steps so you can follow along. You won’t find any posts about rumours, news or opinion. Instead, I only want to provide content that enhances your experience and knowledge of Apple’s products, as well as the apps you use. The Instructional launches February and you can sign up to be notified as soon as it does. You can also follow The Instructional on App.net at @theinstructional or on Twitter at @_instructional. Squarespace Logo helps anyone create a professional logo on their own. All logos are comprised of a few basic elements: text, a tagline, and an icon. With the help of The Noun Project and Google Fonts, we provide a huge array of icons (7,000 and growing!) and fonts that you can easily turn into a unique logo for your business. To give you an idea of how your logo will look, you can use our handy previews to see your new logo on a business card, a website, or a t-shirt. When you’re ready to download your logo, we provide white on black, black on white, and full-color images in a variety of formats. A great idea for budding businesses, especially with the features Squarespace offer with commerce and podcasting in mind. 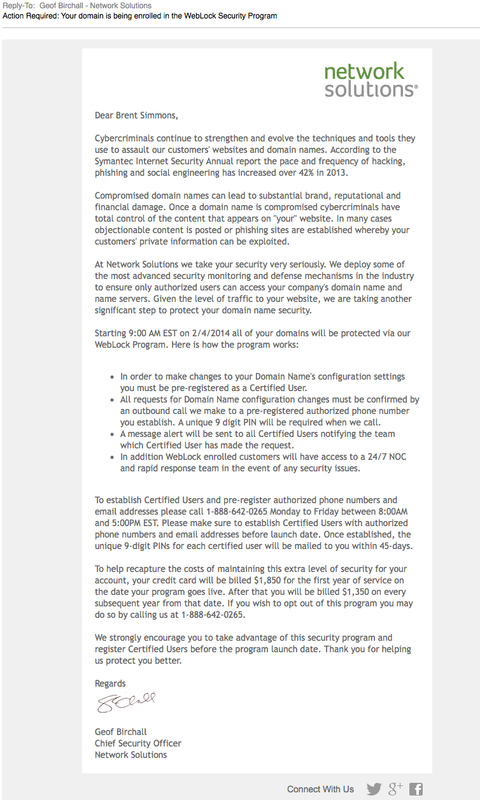 I got an email from Network Solutions — where I still have two domains, originally registered in the ’90s — that informed me I have been enrolled in their WebLock Program. I couldn’t believe that I’d been opted-in, without my permission, to any new product — and I was stunned when I saw how much it cost. And further surprised when I saw that I would have to make a phone call to deal with all this. Opting out of a newsletter is one thing, but being automatically enrolled into a $2,000 subscription without prior consent? That’s disgusting and shameful. You might recognize the hokey headshot as Forstall’s official photo from when he was Apple’s SVP of iOS Software. It’s presumably being used all over City College facilities, almost certainly without his knowledge. The above photo was taken outside a sandwich shop near the CCNY campus in Harlem. A quick Google search turns up Forstall in the announcement for the new card. Notice how Nest avoid answering the question “Will Nest customer data be shared with Google?” on their latest blog post.